THE purposes of the National Society, Sons of the American Revolution are patriotic, historical and educational. Its object is to perpetuate the memory of individuals who, by their services or sacrifices during the war of the American Revolution, achieved the independence of the American people. WE welcome you to the web site of the New Mexico Society, Sons of the American Revolution. 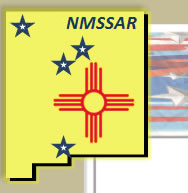 The Compatriots of the NMSSAR invite you to join our ranks as we strive to keep patriotism and the memory of our Revolutionary War heritage burning in the hearts and minds of every American, young and old. THE NMSSAR sponsors events throughout the year, including: oratory and essay contests for young people; awards programs honoring Eagle Scouts, ROTC members and educators, law enforcement and fire safety personnel, and veterans and service personnel; and, ceremonies honoring our flag and the patriots of the Revolution. Descendants (Anglo, Spanish American, or any other ethnicity) of the men who fought in the Revolution and/or supported the Revolution are welcome to join the Sons of the American Revolution here in New Mexico. We have about 100 members in the state and our chapters are open to all who can qualify. Note: Female descendants of those individuals are eligible to join our sister organization, the Daughters of the American Revolution (DAR). Although not commonly known, Spain and NEW MEXICO were involved in the American Revolutionary War. Consequently the present king of Spain and his son are members of the SAR, as well as the descendants of Lafayette in France and those of Bernardo de Galvez of Spain who captured Pensacola, Florida from the British on May 9, 1781, and for whom Galveston Bay and Galveston, Texas are named. The colors on New Mexico's state flag are the red and yellow of old Spain. The simple, elegant center design is the ancient Zia sun symbol, which represents the unique character of New Mexico (the Zia sun symbol also appears on New Mexico's state quarter). In 1920, the Daughters of the American Revolution, who had been quite involved with the official state flag designations in other states, suggested that a new design be adopted that was more representative of the unique character of New Mexico. This idea had many supporters and, as had been done in other states, a design competition was launched. The winner was Dr. Harry Mera, a Santa Fe physician and archeologist. The flag was constructed by Dr. Mera's wife, Reba. The simple and meaningful design features an interpretation of an ancient symbol of the sun as found on a late 19th century water jar from Zia Pueblo. This red symbol is called a "Zia" and is centered on a field of yellow.